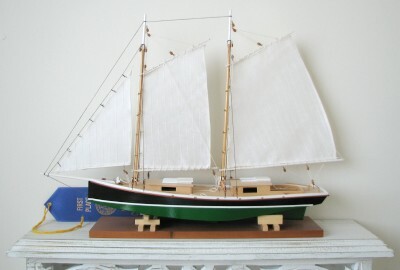 This Midwest Products Sharpie Schooner is one of two static display models that I built for my dearest, Melanie (the other being a Midwest Products Muscongus Bay Lobster Smack). She actually bought them to build herself, but decided to let me build them instead. 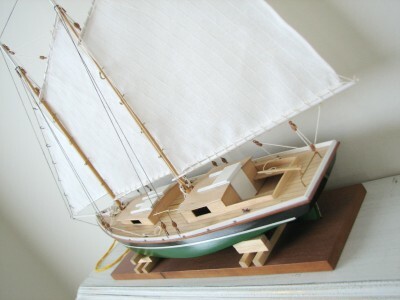 I used my woodworking, metalworking, and painting skills for the structure and accessories, and she used her sewing skills to make the sails. 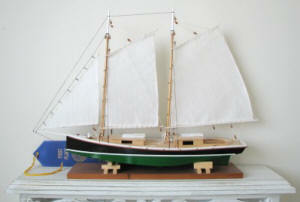 Applying all those tuft strings on the sails was quite time-consuming. Deft Gloss clear was sprayed on the entire structure and sanded between coats for a smooth surface. Then, Testors enamel paint was applied on the bottom of the hull. The effort paid off with a 1st Place ribbon at the 2004 Dixie Classic Fair, in Winston-Salem, North Carolina. Sharpie Schooner A model of one of the so-called "Terrapin Schooners", developed in the late 1800's and used well into the present century for turtle fishing along the Florida & Gulf Coasts.